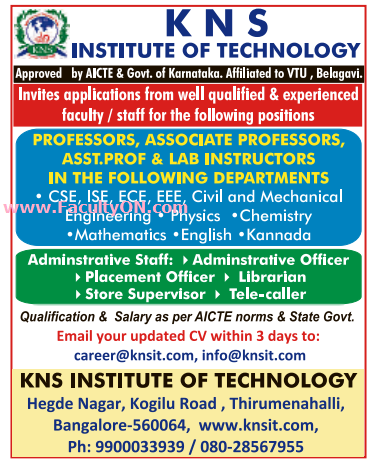 KNS Institute of Technology Bangalore has advertised in the DECCAN HERALD newspaper for the recruitment of Professor / Associate Professor / Assistant Professor Plus Non-Faculty jobs vacancies. Interested and eligible job aspirants are requested to apply within 03 days from 18th July 2018. Check out further more details below. College Profile: KNSIT was built on a sprawling 20 acre campus in Bangalore with superior infrastructure. The vibrant campus of the institution was designed to give more learning space to students. The departmental Blocks are superior in architecture and construction standards. How to Apply: Interested and eligible candidates are requested to send application along with Bio-data, copies of certificates / experience certificates and recent PP size photographs to the following email address.